Like many of their compatriots, musicians Zhenya Kolykhanov and Sergey Vaschenko emigrated from Russia after the fall of the Soviet Union in the early 1990s. They have since established themselves in Texas, USA, and through the formation of a band called the Flying Balalaika Brothers and a non-profit called Musical Connections, they work to bridge cultural gaps by exposing Texans to international art. The Original Flying Balalaika Brothers were formed in Los Angeles in 1995 by Zhenya Kolykhanov (a.k.a. Z Rock), the former lead guitarist of the Russian surf/rockabilly group Red Elvises. The group started as a street band and later transformed into the group Red Elvises; which had a large history of performing for clubs, motion pictures, and tv shows in California. After Zhenya set up shop in Austin TX, he reestablished The Flying Balalaika Brothers. The band represents a blend of traditional world music and original musical pieces. The group has found a home in the musically rich culture in Austin TX. Kolykhanov graduated from Tchaikovsky Music College in Vologda, Russia, in 1984. He later came to the United States to study critical thinking, reading and fine arts at the University of Delaware. In addition to the balalaika, Kolykhanov plays guitar, composes songs for television, and creates art for commercials. Sergey Vaschenko earned a bachelor’s degree in conducting and balalaika from Lysenko State Music College in Poltava, Ukraine, in 1980 and a master’s in orchestral conducting, teaching and balalaika performance from the Mussorgsky Ural State Conservatory in Sverdlovsk, Russia, in 1985. Vaschenko’s experience includes: Dean of the Faculty of Arts for Perm State Institute of Culture in Perm, Russia; guest soloist for the Latvian Chamber Orchestra in 1989; music educator in Russia, Latvia, Spain, Dallas and Austin; and guest conductor for the Houston Balalaika Society. He won an international award at the music festival in Segovia, Spain, and was a contender for a 2003 and 2008 Grammy award in the world music category. In addition to touring and performing, they began successfully presenting educational programs in three languages (English, Spanish and Russian) to students of Texas public and private schools, celebrating the arts in all its diversity by providing a unique approach to studying both the profound similarities and distinctive differences of people throughout history and around the world. Russian pianist Valeri Grohovski performed in Austin on January 20, as part of a Musical Connections concert series , playing jazz interpretations of works by Bach and Mozart. 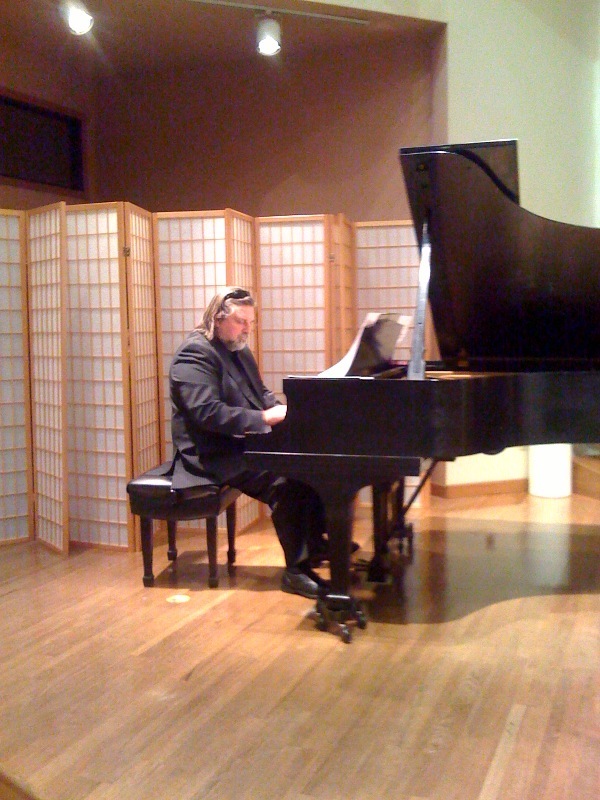 Russian pianist Valery Grohovski played jazz interpretations of Bach and Mozart in Austin, Texas, on January 20, 2012. Photo by Donna Welles.